SURVEY TIME! Which icon is your favorite? Posted: Wed Aug 15, 2012 6:20 pm Post subject: SURVEY TIME! Which icon is your favorite? Good evening gamers! Arkadium is working on a new game and we want to hear what our fans have to say about its icon. There are 9 numbered icons on this picture of an iPhone screen. If this was the icon for a game you played, which icon do you like the most, and feel like you would want to click on it? Post a number 1-9 to let us know which one you like, and tell us why! *EDIT: I changed the picture to be easier to see all the choices, and also added a #10! Since you are creating a game similar to Mahjong Dimensions, then I would choose #6 since it is similar to one of the cubes, yet a bit different. My second choice would be #7 because it is actually a Mahjong cube. In my opinion, if you are going to create a game, and have an icon for it, that icon should be similar to the game for easy reference. 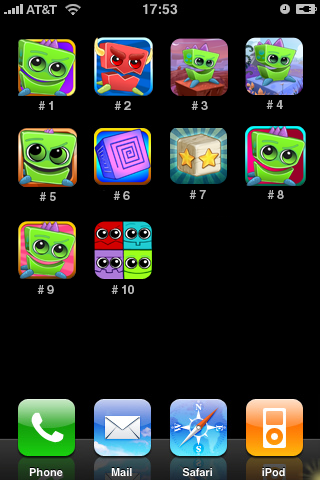 Although I do think some of the other icons are cute or very nice, only #6 and #7 would tie in nicely to a Mahjong-Similar game. I have to agree with krazykop, I think only #6 or #7 would tie nicely with a Mahjong dimensional game, unless the tiles actually have brightly colored smiley faces on them. I think #7 would be my first choice, #6 my second. Yup! I have to agree with krazykop and g8rmom. Sorry ElCee,but I've got to agree with krazykop,g8rmom and Sassarina. I do like the others too,but for a mahjong type game I would choose #7 as my first choice and #6 for my second. I chose #7 first just because I like the star on it. Don't feel bad ElCee,I have a flip phone(one of the first ones)that I won't trade in AT all. I wouldn't begin to know how to use an i-phone...or any other kind!! Theres going to be a new mahjongg game??? I must have missed where gdgbrian says that.